This book provides a detailed review of the modern theories dealing with the structure and properties of water. 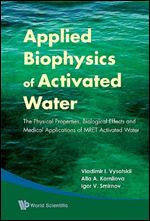 It also presents an analysis of the research on the effect of activated water on biological systems such as animals, microorganisms, and plants. The results of experiments on the influence of activated water on pure microbiological cultures and their natural associations are described, the studies being carried out under both aerobic and anaerobic conditions.